A 'slipped' (prolapsed) disc often causes severe lower back pain. The disc often presses on a nerve root which can cause pain and other symptoms in a leg. In most cases, the symptoms ease off gradually over several weeks. The usual advice is to do normal activities as much as possible. Painkillers may help. Physical treatments such as spinal manipulation may also help. Surgery may be an option if The spine is made up of many bones called vertebrae. These are roughly circular and between each vertebra is a disc. 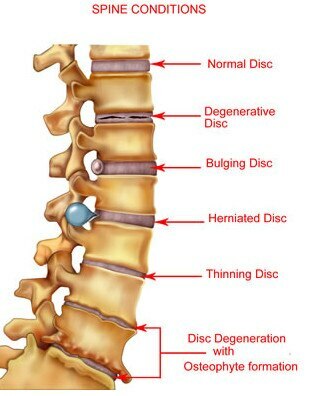 The discs are made of strong rubber-like tissue which allows the spine to be fairly flexible. A disc has a stronger fibrous outer part and a softer jelly-like middle part called the nucleus pulposus. The spinal cord, which contains the nerves that come from the brain, is protected by the spine. Nerves from the spinal cord come out from between the vertebrae to relay messages to and from various parts of the body. Strong ligaments attach to the vertebrae. These give extra support and strength to the spine. Various muscles also surround, and are attached to, various parts of the spine. (The muscles and ligaments are not shown in the diagram below, for clarity.) Note: this leaflet is about a 'slipped' (prolapsed) disc in the lower back (the lumbar spine). There is a separate leaflet about disc problems in the neck, called Cervical Spondylosis.